Over the years Norwich City have had a fair amount of distinctive kit designs with some being more memorable than others. The use of bold colours, retro shapes and snazzy patterns have all contributed towards the history of the Club’s identity. 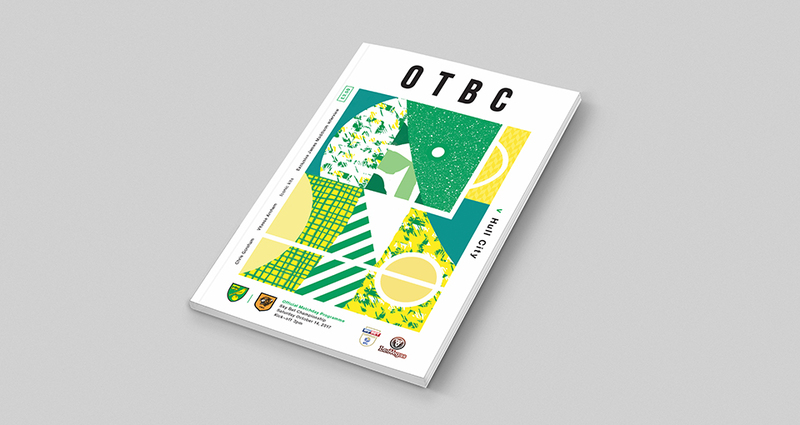 Snippets of these classic kit patterns have been used by local artist Tom Abbiss Smith who has created an abstract piece of digital collage for our latest OTBC programme cover. Tom graduated from the Norwich University of the Arts only last year but is already making great waves in the industry and we’re really excited to have teamed up with him. "My artwork for OTBC’s matchday programme is inspired by the huge variety of patterns, shapes and textures related to football. I believe all the visual information you see, from the penalty box to the texture of the goal net is unique and an important part of the game. Even the movement of the players has a pattern and this is all portrayed through simple visual information in the design. I typically incorporate patterns into my personal work, however the opportunity to place NCFC’s kit patterns into this piece really excited me as a way to make the design personal to Norwich, whilst also having lots of fun!"